For the first baseman, see Jack Sanford (first baseman). For other people with this name, see John Sanford (disambiguation). 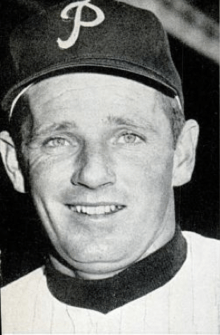 John Stanley Sanford (May 18, 1929 – March 7, 2000) was an American right-handed starting pitcher in Major League Baseball, and later in his career a relief pitcher as well, for the Philadelphia Phillies, San Francisco Giants, and California Angels. He finished his career playing very briefly with the Kansas City Athletics. Sanford was born in Wellesley Hills, Massachusetts. He won the National League's Rookie of the Year award in 1957 with the Phillies for a season with outstanding numbers. That year, he was 19-8 with a 3.08 ERA in 33 starts. He had 15 complete games on the season, including three shutouts. Impressively, he also finished the season with 188 strikeouts, which led the league. His next seven years would be extremely solid, but never quite as impressive as his rookie season; or according to some, he never improved much after it. After being traded to the Giants for the 1959 season, Sanford went 15-12 with a 3.16 ERA in 222 innings pitched and completed 10 games. That year, he started 31 games and made 36 appearances, 5 out of the bullpen. Sanford's best bid for a Cy Young Award came in 1962 when he finished 24-7 with a 3.43 ERA for a very good Giants team. He won 16 consecutive decisions from mid-June to mid-September and was named Player of the Month in August for his second straight 6-0 month (he also posted a 3.55 ERA, and 31 SO). Sanford led the Giants to the NL pennant and a chance to face the New York Yankees in the World Series. It was the only time he would get to play in the postseason, but the Giants lost to the Yankees after Sanford lost Game 7, 1-0 to Ralph Terry. (The Giants lost the Series by inches: Yankee second baseman Bobby Richardson caught Willie McCovey's line drive with Willie Mays on second and Matty Alou on third; a foot or two to either side and both runners would have scored and the Giants would have won the Series.) But his statistics in the Series were outstanding. He had a 1.93 ERA with 23 innings pitched and only 16 hits. He had 19 strikeouts and only a 1-2 record due to lack of run support. He would also fall short of a Cy Young Award that year, coming in second in the voting to Don Drysdale. After he left the Giants, his best seasons were behind him. He ended his career on August 6, 1967 with Kansas City. In his career, he posted a solid 137-101 record with a 3.69 overall ERA in 2049 innings pitched. He pitched in 388 games (293 starts), accumulated 1182 strikeouts and gave up only 840 earned runs. He also finished in the Top 10 in MVP Award voting twice in his career (1957, 1962). He finished 2nd in the league in wins twice, losing in 1957 to only Warren Spahn and in 1962 to Cy Young Award winner Don Drysdale. Sanford died of a brain tumor at age 70 in Beckley, West Virginia.